A wine bottle, two glasses & a book appear. 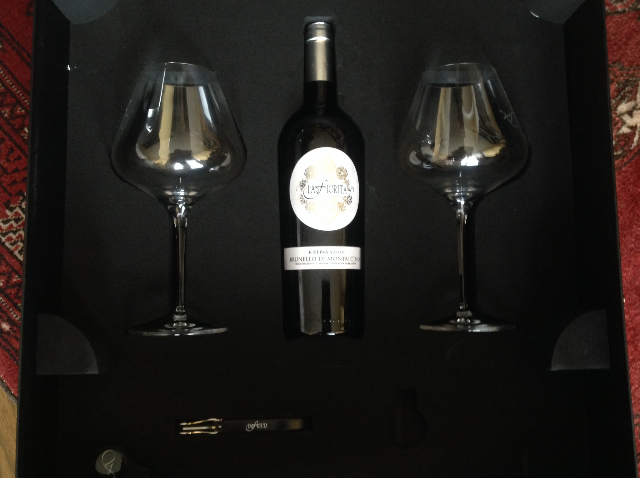 Enjoy the bottle of La Fiorita 2006 Brunello di Montalcino Reserva! It’s a special year for me and I hope you like it. I can’t wait to hear your honest thoughts. The package was brought upstairs to my office, opened and photographed, as you can witness. The packaging was so elaborate, yet personal. 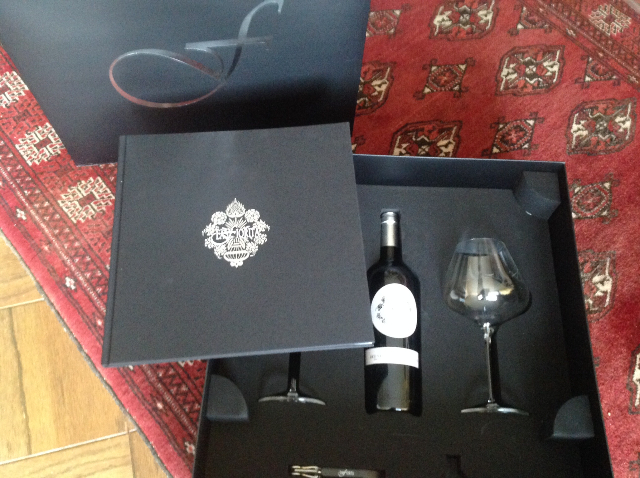 The book was of wine photography, the wine glasses were made especially for Brunello and the cork screw was very special. A lot of effort went into the presentation of the 2006 La Fiorita Brunello di Montalcino Reserva. Rather then open the bottle immediately, I thought it would be best to age the wine a little longer. And that is what I did. Natalie Oliveros is wine driven. In 2011, Natalie partnered with Roberto Cipresso, a legendary influential winemaker and consultant. The two have made considerable upgrades at La Fiorita since joining forces. The planting of newly acquired plots and an expansion of production were the priorities, coupled with a new cellar that housed state of the art equipment. The vineyard is relatively new by any standard, 1992. The first vintage netted 1000 bottles. Since the early days, the vintages have grown steadily. The 2006 Brunello di Montalcino Reserva vintage amounted to 10,000 bottles. Before bottling, the wine spent twenty-four (24) months in either French or Slovonian oak, eight (8) months in stainless steel and then thirty (30) months in the bottle. The non-reserve follows the same aging process except it is aged six months less in the bottle. Total production of Brunello is 25,000 bottles. Roberto Cipresso was the head winemaker for esteemed Achaval Ferrer (Argentina) and several of Italy’s classic vineyards, Ciacci Piccolomini, Casa Basse and Poggio Antico. Mr. Cipresso started with a little over an acre at Tuscany's La Fiorita. Sangiovese is the main grape. Since the partnership of Natalie Oliveros, La Fiorita has grown leaps and bounds. The vineyard is now divided into two parts, the first part is the nine acre Poggio plot that faces the south-east, with elevation of 700 feet. The second plot (7 acres) is called Pian Bossolino and faces towards the east. Mr. Cipresso pulls out all of the stops with his wines, as you can see via his aging process. I decanted the 2006 Reserva for four (long) hours. The thought of the wine was my focus during that period of time. As the time approached, I poured a glass of the 2006 La Fiorita Brunello di Montalcino Reserva. My intention is to keep three glasses in the decanter and try this wine, again, on day two, three and four. At close to $90 a bottle, my hope was that I made the right decision. Elegant, creamy, glycerol with hidden minerality. Aromas of dark fruit like plums, blackcurrants and sour cherry abound. The wine needs more time to breath. A bouquet of violets and mocha with a powerful intensity fill the air. The tannins have settled somewhat and are quite hidden. A glycerol coating of my mouth is hidden under the lush ripe cherry flavors that linger on my palate for several minutes. The legs on the glass show what sustaining power this wine has. The aromas are subtle, but dominate. Lavender prevails, followed by smoked chorizo. My palate is immersed with a silky, flavorful and concentrated black raspberry flavor. The wine is bold and ageless. The wine has held up to the elements on day four. Aromas of strawberries and hazelnuts abound. My palate detects leather, vanilla and smoke nuances as key elements in this rich, complex, balanced wine. Decanting for several days or aging this wine is suggested. The 2006 La Fiorita Brunello do Maontalcino is a classic wine that is well made and has lasting power due to the ability of master winemaker, Roberto Cipresso. Add Natalie Oliveros’s sincere love for wine and success at any price policy to the scenario and you have a vineyard whose better days lie ahead. The 2006 Reserva wine received 95 points from Wine Spectator. My belief, a near 100 point wine will emerge for La Fiorita in the next couple of years. "Great article regarding LaFiorita. 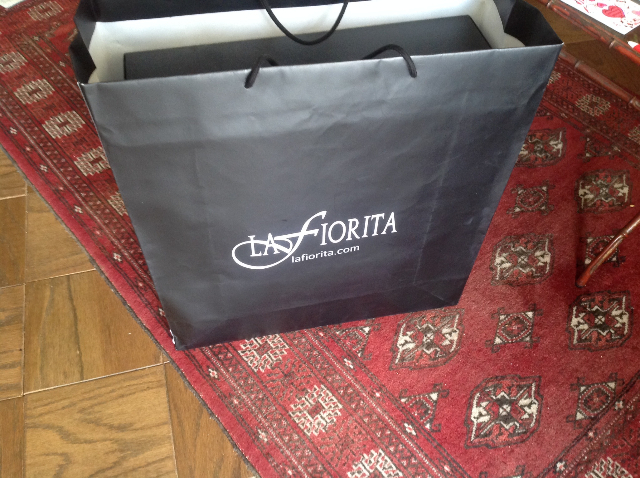 Natalie Oliveros is driven yet a very kind lady"
"Great article regarding LaFiorita. Natalie Oliveros is driven yet a very kind lady."